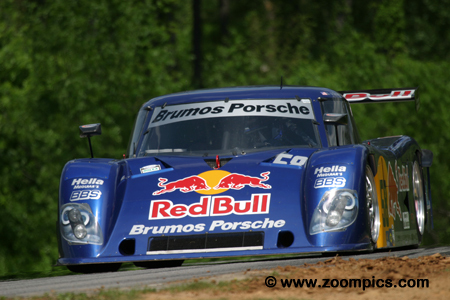 Round four of the 2007 Grand American Road Racing Championship was conducted at Virginia International Raceway (VIR). 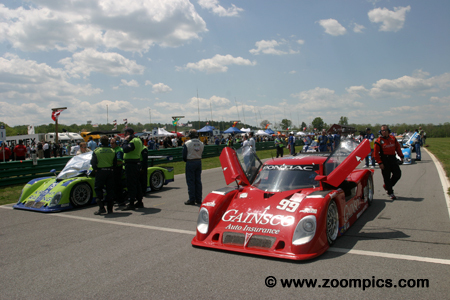 Competitors in the Daytona Prototype and Grand Touring categories would compete in separate races. This was the first of five weekends in 2007 where the two classes would be not be combined. Each race was scheduled for seventy-seven laps (400-kilometers) around the eighteen-turn 3.270-mile road course. The starting line-up for the 2007 Virginia International Raceway 400. 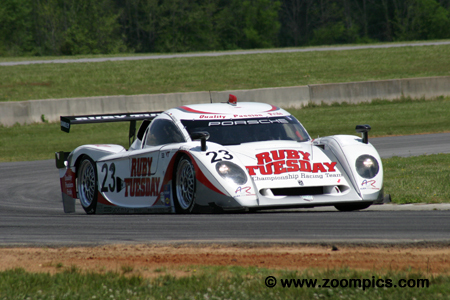 This would be round four in the fourteen race series for the Daytona Prototypes. Occupying the front of the grid are the Krohn and Gainsco/Bob Stallings entries. On the pole is the Krohn Racing Riley MK XI. During qualifying, Colin Braun set a new lap record. Sharing the front row, for the fourth time this season, is the No. 99 Riley MK XI shared by Alex Gurney and Jon Fogarty. In corner three, on the first lap of the Virginia International Raceway 400 and pole-sitter, Colin Braun is challenged by the second fastest qualifier, Jon Fogarty. Braun led lap-1 but Fogarty would make a successful pass and be in first place for the next six laps. Unfortunately, contact early in the event with the Team Sigalsport entry and later in the contest, an off-course excursion dropped Fogarty and Gurney to a fifth place finish. 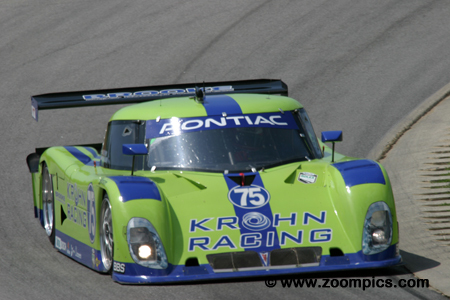 Krohn Racing entered two Pontiac-powered Riley MK XIs. 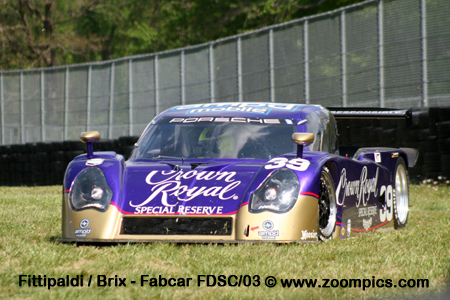 One for Nic Jonsson and team owner, Tracy Krohn and a second car driven by Colin Braun and Max Papis. In qualifying, Braun set a new lap record in the No. 75 Riley. Always in contention, Papis was leading the race when he was passed with twenty-five laps to go by Max Angelelli. He could not maintain Angelelli’s pace and finished in the runner-up position – 3.567-seconds behind the winner. Alex Gurney, driving the No. 99 Riley MK XI set the quickest time in the first test session. Throughout the weekend, Gurney and his co-driver, Jon Fogarty were at the top of the time sheets. 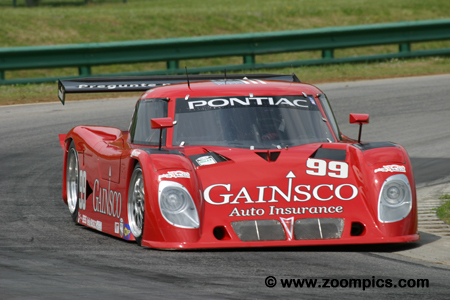 Already in 2007, they had earned their first Grand Am victory and had three starts from the front row. 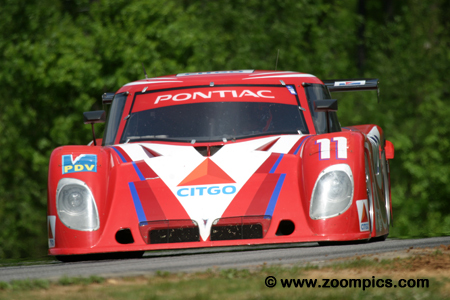 At VIR the duo would add to these statistics when Fogarty turned the second quickest time in qualifying. Unfortunately, problems during the race resulted in a fifth. 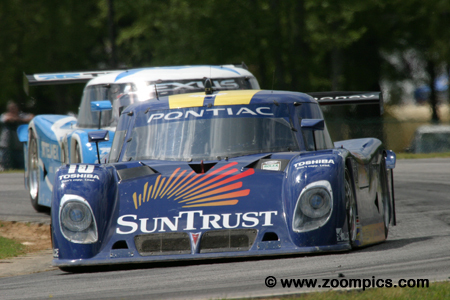 The SunTrust team had podium finishes in the first three races of the 2007 season. At VIR, Jan Magnussen performed the qualifying duties and was fifth quickest. Sharing the car with Magnussen was Max Angelelli. 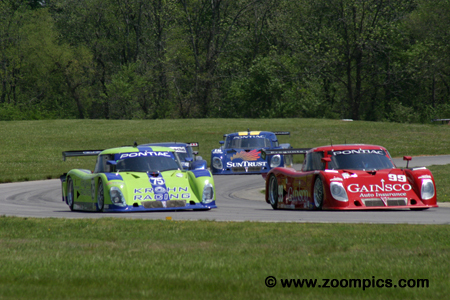 During the race, the pair were never out of contention and on lap-52, Angelelli passed race leader, Max Papis for the win. It had been almost a full year since the team’s last victory. The win also gave the pair the points lead. The Brumos Racing crew were competing with heavy hearts as the team owner, Bob Snodgrass had passed away the previous Tuesday. The No. 58 Riley MK XI was driven by David Donohue and Darren Law. Despite crashing the car on the last lap of qualifying, Law recorded the third fastest time. The car was in fourth position as the race came to an end but on the final lap the third place car ran out of gas – the Brumos entry inherited the final spot on the podium. Defending race winners, Patrick Long and Jorg Bergmeister drove the No. 23 Alex Job Racing prepared Crawford DP03. A suspension failure during qualifying prevented Bergmeister from setting a time – the Porsche-powered Riley would start in the final grid spot. The pair made progress during the race and finished mid-pack in ninth position. For their performance, they were earned the ‘SunTrust Improve Your Position Award’. Driving the No. 11 SAMAX Riley MK XI were Ryan Dalziel and Jean-Francois Dumoulin. Dumoulin replaced regular driver, Patrick Carpentier who had to attend to a family emergency. The Pontiac-powered Riley started in the ninth grid position but was in third place as the race came to its conclusion. Dalziel was behind the wheel when the car began to run out of fuel and lost a position to the Brumos entry before the checkered flag. 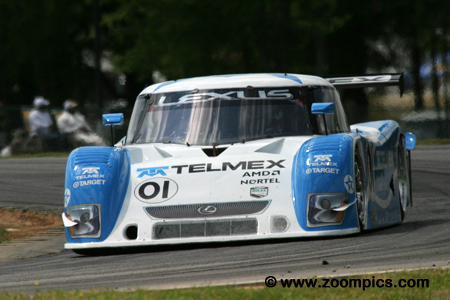 Memo Rojas had the honour of qualifying the Chip Ganassi Racing Riley MK XI and set the fourth quickest time. Rojas shared the driving with sports car veteran and points leader, Scott Pruett. Rojas drove the first stint and led for two laps before spinning off course. Pruett suffered the same fate on lap-24 in corner four. The pair fell out of contention but managed to finish eighth – Pruett lost his points lead to Angelelli and Magnussen.